In one of the great playoff games in recent memory, a gimpy Aaron Rodgers and the Green Bay Packers survived a rough first half to defeat the Dallas Cowboys 26-21 on Sunday at Lambeau Field. The game’s biggest play came in its waning moments as Dallas faced a 4th and 2 in Packers’ territory. Tony Romo lofted a pass down the far sideline intended for Dez Bryant. The Pro Bowl receiver made the catch but when he fell to the ground, the ball came out once it hit the ground. Originally called a catch on the field, the call was overturned and the Cowboys were out of luck. 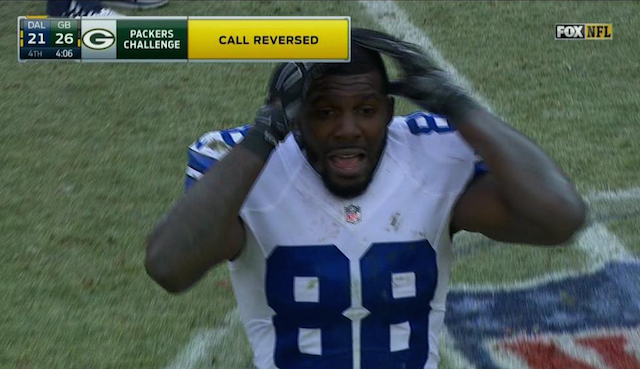 A turnover on downs and a few plays later and the Cowboys’ 2014 season was over. Soon after the play happened, the Lions tweeted out a photo in reference to the infamous Calvin Johnson play from a few seasons back. Why are we still talking about completing the process? Yes, it’s the rule (and a somewhat strange one at that) but the ball comes out on the lunge by Bryant after he takes three steps and then falls to the ground. Hard to wipe that one off the board. However, as soon as I saw it, I smelled the Calvin Johnson Rule and rightfully so if the game was being officiated by Gene Steratore – who also handled the Johnson play. Ref in Calvin Johnson game: Steratore. Ref in Dez Bryant game today: Steratore. By the letter of the rule, was it a catch? However, is the rule stupid? It needs to be amended during the offseason.